Computer programs are continually changed and improved based on customer feedback and continuing product testing. Problems are resolved, features are added, and security is improved throughout the life of the programâ€”and, as a registered user, you should benefit from those improvements. By checking Microsoft Update regularly, you can make sure you've got the most recent Windows and Office improvements available to you. Visit Microsoft Update to start the update process. If it's your first time to visit Microsoft Update, you might need to sign up to the service. 1. For high-priority updates, click Express Install (recommended). If you're just looking for general updates that aren't critical, choose Custom Install. 2. The site will do a quick check of your system to see whether any new updates are available that have not been downloaded to your computer. When the check is finished, a window appears showing you any new updates ready for download. 3. Follow the on-screen instructions and click Install Now to update your computer with the latest software improvements. 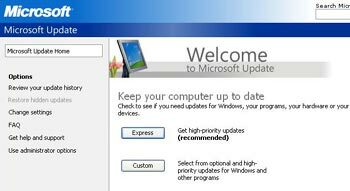 Once you've visited the Microsoft Update site, you should also configure your computer to receive critical updates automatically. This service is called Automatic Updates and it's free. Note: If the Performance and Maintenance category is not visible, click Switch to Category View. 4. In the System Properties dialog box, click the Automatic Updates tab. 5. Select a setting. Microsoft recommends selecting Automatic: Automatically download recommended updates for my computer and install them. You can schedule Automatic Updates for any time of day. Remember, your computer must be on at the scheduled time for updates to be installed. We recommend choosing a time when you will not be using the computer for other tasks. 6. If you choose to have Automatic Updates notify you in step 5, you will see a notification balloon when new downloads are available to install. Click the notification balloon to review and install updates. Important If you choose an option in step 5 other than the one we recommend, you must download and install every critical update. 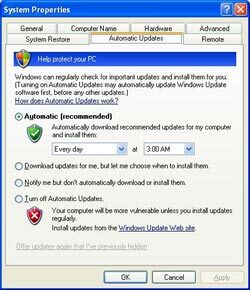 If you download the updates, but forget to install them your computer will not be protected with all the latest enhancements.